The Ryukyu Golden Kings will face the George Washington University team in the International Friendship Match 2016 at the Okinawa City Gym on Aug. 21. The George Washington Colonials plays in the 1st division of NCAA in the U.S., and received a bid to play in the NIT (National Invitation Tournament) in March and won the tournament for the first time. The match against the Golden Kings marks the first time for the university team to play in Japan. Yuta Watanabe from Japan is one of the main players in the visiting team. According to his Japanese fans, Watanabe is likely to become the next NBA player from Japan, and the audience here should pay close attention to his play. Golden Kings officials say they organized the match in order to build up the team power and give it international experience. Yuta Watanabe was born Oct. 13, 1994, in Kagawa Prefecture. He was the pillar of his Jinsei Gakuen High School basketball team, and was selected to the Japanese Under 18 National Team, when he was just on the 1st grade of the high school. A year later he was picked up to the Japan National Team for the William Jones Cup. When he was on the 3rd grade of the high school, he was again selected to play with Japan’s national team, and also a captain for the Under 18 National Team. He has had plenty of experience playing in the national team from a young age. 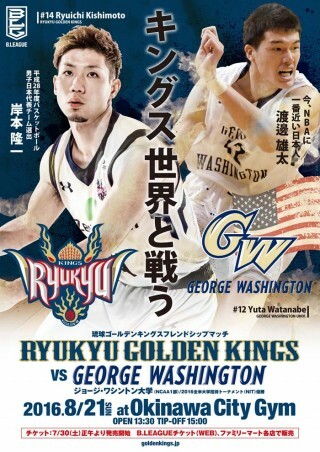 Now Watanabe is a member of George Washington Colonials, and the 4th player from Japan to play in the NCAA Division 1 in the U.S. With his over 2-meter-tall frame, he drives offense well and completes lots of outside shots. He’s an all-round player, who has no disadvantages against foreign players. He played a successful series at NIT this March, and led the team to the championship. He’s now on his 3rd year in the university and expected to show increasingly good performance with the team. International Friendship Match 2016 at the Okinawa City Gym on Sunday, Aug. 21 starts at 15:00. As there is very little parking available at the gym, organizers advise using public transportation. There are shuttle buses from AEON Rycom to the gym from 13:00 until one hour after the game ends. The gym is within a walking distance from Kadena AB Gate 2. Tickets are on sale now at B.LEAGUE online at and FamilyMart ticket terminals.